Kitchen cabinet hardware near wholesale from Aarons Kitchen including Ferrari and Amerock cabinet hardware. Kitchen pulls (knobs, handles), hinges, drawer slides, Lazy Susans and other kitchen cabinet accessories. Cabinet door hinges by Salice, Lama, Blum and Ferrari. A cabinet door will look almost like new with a new knob or handle. It is a cheap way to bring your kitchen alive. Any accessory you add such as a trash or recycle bin will add greatly to the enjoyment of your kitchen. We ship to the USA and Canada. Kitchen cabinet hardware . Be sure to see our Soft Close Drawer Slides and Soft Close Hinges. We have a great line of Ferrari Hinges, Ferrari Plates and bulk deals on many of our products. If you can not fine the product in the above pages please email us and we will try and help you or find the item for you. Below you will see "New Arrivals" where we place the new products that are selling good. The "Must See's" is an area where we have placed items that our staff is excited over and feel they need to be seen. The "On Sale This Week" and our "Clearance Center" is where you just might find that special item you came here to look for. If you are looking for cabinet handles or cabinet knobs we should have what you are looking for in one of our selected areas. 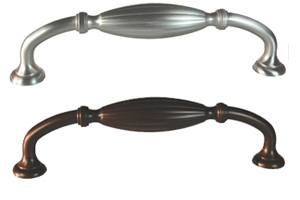 Bar pulls have been a great seller for many years and are still in the top 10 sellers. Soft Close Drawer Slides have arrived and can be seen in our Soft Close Drawer Slides area of the web site. We offer a few different types and many sizes. .. READ MORE. Berenson HEARTHSTONE COLLECTION . We have added a few NEW collections from Berenson. You can see this new collection here HEARTHSTONE COLLECTION or visit our full line of cabinet handles,.. READ MORE. Cabinet Hardware . We have added many new items to our cabinet hardware collection with cabinet handles and cabinet knobs. 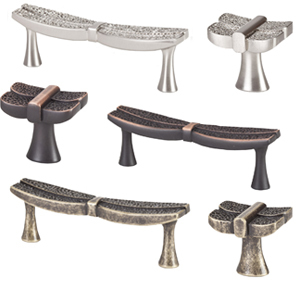 Please see our Cabinet Hardware here or visit our home page to see our full l.. READ MORE. Soft Close Hinges for kitchen cabinet and other furniture with doors using self close hinges. See the Soft Close Hinges here, or visit out full cabinet door hinges line... READ MORE. UniSoft , the latest innovation from Grass, is a Soft Close adapter for doors. The UniSoft mounts independently from the hinges in the upper corner of your cabinet and instantly allows the cabinet do.. READ MORE. Stainless Steel Bar Pulls, cabinet handles, knobs and pulls. We have added a new stainless steel bar pull to our already great stainless steel bar pull collection. These new stainless handles have a square base instead of the traditional round post style base... READ MORE. Oil Rubbed Bronze Bar Pulls have arrived. Oil Rubbed Bronze Bar Pulls have arrived. We have now added a new color to our great selling brushed steel ( brushed nickel ) bar pull collection... READ MORE. Full extension drawer slides have become a big hit with builders and home owners alike. Full extension drawer slides are now affordable to anyone. .. READ MORE. Cabinet hardware has been added in Bulk. The Bulk Deals section of our web site was added due to request from customers wanting cabinet hardware in high volumes at reduced pricing... READ MORE. Appliance Hardware is used for refrigerator handles, sub zero handles, and freezer handles. Sizes 4 to 19 inches on centers. Choose appliance hardware in either the 4" hole spacing ( center to center ),.. READ MORE. We have added a few super discounted items to our On Sale This Week area of the web site. Bar Pulls, Waste Bins / Trash Cans, even a Cabinet Drawer mounted pull out folding Ironing Board... READ MORE. The exciting new look in 2006 for your kitchen cabinet hardware is the clean clear look of steel. Kitchen cabinet handles, knobs and pulls are available in brushed or stainless steel... READ MORE. We are proud to announce that we now have an extensive line of decorative hardware in the fashionable oil rubbed bronze finish. This highly sought after finish comes in a variety of handles,.. READ MORE. We now offer a full line of kitchen cabinet hardware near wholesale from Aarons Kitchen Cabinet Hardware. Including hinges and plates from Ferrari... READ MORE.